"His secrets weren't the harmless kind. The thing inside of him wasn't normal. And our connection was so far outside of anything I knew, I couldn't even begin to understand it. But it was earthshaking. And I didn't know how that made me feel." Let me tell you this: I was a big twilight fan a few years ago, but I've sort of outgrown it. I can't enjoy the books as much as I did back then. I read fifty shades and I hated it. It's just really not my thing. The first time he hit her, I wanted to punch that madman in the face. But Anna, the main character kept crawling back to him. I don't see that as a good example for the girls and women out there. 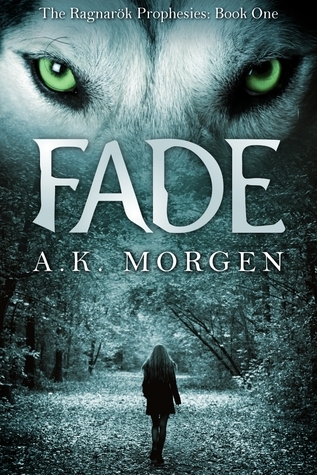 After I read the first 100 pages of Fade, I had to admit that I felt a twilight/fifty shades vibe. But here's the biggest surprise: I really liked this book. I just wanted to keep reading all night and all through the day. The main character isn't as infuriating as Anna was in fifty shades, she's actually a girl that, although vulnerable, has a strength about her. The romance isn't mellow, or totally unrealistic, it's mysterious and exciting. The story keeps you guessing and the way Ms Morgen describes the rush of feelings Ari gets each time she touches Dace left me pining for the same thing. The reason I'm particularly loving this book, is because of the whole myth background. I'm a sucker for myths and legends and this book was a great story about one coming to life. Near the end of the book, I grew a little bit tired of their constant undying love, but not to the point that it made me stop reading. I understand why they love each other this much, so I could accept it. The end itself was a bit rushed. Everything seemed to be happening all at once, while the rest of the book was rather slow paced as we get to share a lot of Ari’s thoughts. I wasn’t always happy with the word choice when reading Ari’s thoughts, but I guess you can’t expect a teenage girl to think in poetic verses. The conclusion made me curious, so I'm definitely reading the next book in this series! I can't say this is a big quality story, but I liked it none the less. It made true on the potential it had, where lots of young adult books don't even come near the level they should be at. I'm not really sure if this is a young adult story by the way, there are some spicy scenes in there that made even me blush a little. I really want to thank curiosity quills and A.K. Morgen for the opportunity to read this book.